Lots to do these holidays for lucky little Melbournians! 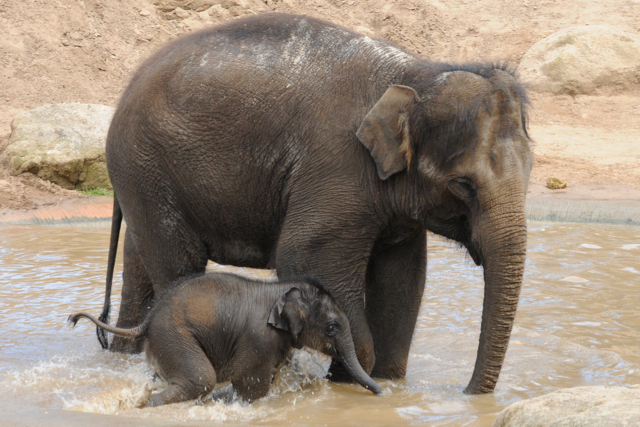 Have you always wanted to know how to wash the largest land mammal in the world? Now you can spend all summer long finding out how. Stop past the barn every day at 9am or 11am to find out or catch the twice-daily Keeper Talk. And the best bit – the Melbourne Zoo is opening an hour earlier for the summer months from December 26 2016 until January 29 2017. Kids under 16 years old receive free entry every day of the summer school holidays too! More info on the Zoo's website. Set in the lush surrounds of Werribee Open Range Zoo, Rhythm of Africa returns with a fantastic program for families with live African music and kids’ activities. Now in its twentieth year, Rhythm of Africa has become a must-do summer tradition, bringing together families and friends for a magic mix of warm summer nights, African beats and picnics on the grass. This year’s concert series will run every Saturday night from 7 January to 25 February, with kids under 16 free. If the weather’s warm don’t forget to bring the kids’ bathers and watch the sun set from Hippo Beach. While you relax beneath the thatched umbrellas the kids will love playing in the sand and cooling off under the fountains. Creek Play is the coolest way to have fun at the Healesville Sanctuary all summer long. Spot true-blue kangaroos hopping around their home, catch Platypus keeping cool and see the koala family settled in the new Koala Forest treetops boardwalk. It’s an all Aussie adventure and a must-see destination for visiting friends and family wanting to experience the real Australian bush and the best thing - kids under 16 years old receive free entry every day of the summer school holidays! Learn how to draw fresh water fauna with artist Andrew Seward with the Fresh Water Drawing Classes for adults and children at the Melbourne Museum. $30 to $40 excl. museum entry. Bookings essential. Help create a long cool freshwater painting along the upstairs walkway of the museum with the Water Colour Wonderland FREE activity. If you pop into the Melbourne Museum these holidays, don't forget to visit the awesome Pauline Gandel's Children's Gallery. Our review on the blog. Join the robot frenzy school holiday activities and workshops at Scienceworks museum with a FREE Robots Redefined Live Show, and FREE Ready Steady Rollbot activity. If the kids are older, they can take part in Robot workshops - Sphero Rollbot Workshop, Beginners and Advanced Robot Workshops using Lego - $25 to $45 excl. museum entry. Reveal special museum objects and stories in this treasure-hunt FREE activity for families of all ages. Grab a ‘My Backpack’ booklet and hunt for treasure and stamp your journey through the Immigration Museum. Be swept away by the sweet sounds of jazz in New York City at the State Library of Victoria! Inspired by Gus Gordon’s Herman and Rosie, explore the hustle and bustle of the Big Apple, swing by the hotdog stand and experience this delightful tale of friendship and music. This Play Pod theme is open daily from the 1st of December 2016 to 28th of February 2017. Our latest reviews of the Play Pod on the blog. The 2017 NGV Kids Summer Festival will celebrate four-legged friends and the magic of storytelling, drawing inspiration from the NGV’s dynamic suite of summer exhibitions including summer blockbusters Viktor&Rolf: Fashion Artists and David Hockney: Current during 11 days of FREE holiday fun across both NGV sites from Monday 16th to Australia Day Thursday 26th of January 2017 between 10am and 3pm daily. More info on the blog. Experience the world of Viktor & Rolf through the main exhibition Viktor&Rolf: Fashion Artists and the kids FREE installation Atelier: Viktor&Rolf for Kids. Children are invited to use a variety of materials including strands of raffia and white crepe paper in hands-on activities inspired by Viktor & Rolf's design codes which include collars, bows and elaborate ruffles. Our review on the blog. 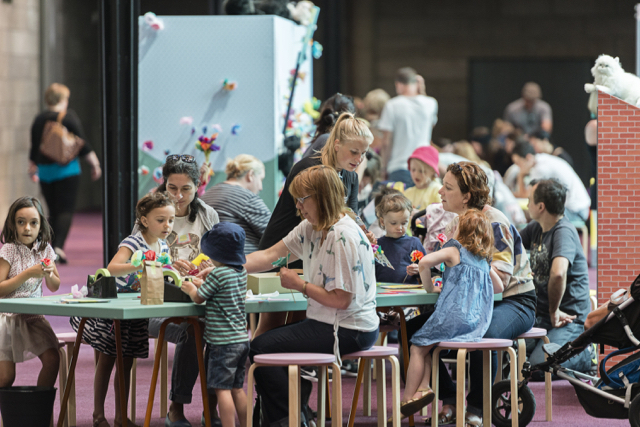 Checkout our kid friendly spots and exhibitions this summer at the NGV. We love the neon pink car wash structure in the NGV International Garden for the 2016 NGV Architecture Commission by Melbourne based M@ STUDIO Architects. More info on the blog. Join the Polygot Theatre at the M Pavilion this January for Sound of Drawing, a participatory workshop-slash-performance for visitors young and old. Sound of Drawing combines texture and technology to create a collective art soundscape. On from Monday 9th to Sunday 15th January 2017. More info via their website. The Arts Centre Melbourne will present two fun FREE family events in January: Les Moutons and Imaginary Architecture as well as the much awaited Room on the Broom production. The Les Moutons are ‘sheep’ who will take up residence on the Arts Centre Melbourne Lawn. They look like sheep, they sound like sheep and they even get sheared. With more than 300 performances worldwide drawing in the crowds, Les Moutons is a truly innovative experience that bends reality in surprising ways. From the 19th to 22nd Jan.
Young architects and building enthusiasts will come together and draw on their limitless imaginations to build a mega mini-city for all to explore using nothing but their hands and empty cereal, tea and biscuit boxes at the Imaginary Architecture from the 4th to 15th Jan at Smorgon Family Plaza. The Melbourne Recital Centre’s 2017 Music Play Children’s Festival is on again this Summer from Wednesday 11th to the Saturday 14th of January with a range of mini concerts, big concerts, workshops, free foyer fun and more. Children 0 to 12 years old and their families can discover music, play an instrument and make some great noise at the festival. More info on the blog. Experience the interactive journey of Finding Dory and Friends: The Experience at the Melbourne Aquarium. The interactive journey Pipe Pals trail will guide and surprise little ones with tales of amazing underwater animals, leading you into Dory’s Reef. Experience fun activities including Ridin’ the EAC with Crush, Nemo’s Anemone Challenge and using your own echo locator in Bailey’s Maze. Our review on the blog. Take a trip down to the Mornington Peninsula and head to the Sand Sculpting event on the Frankston Waterfront. 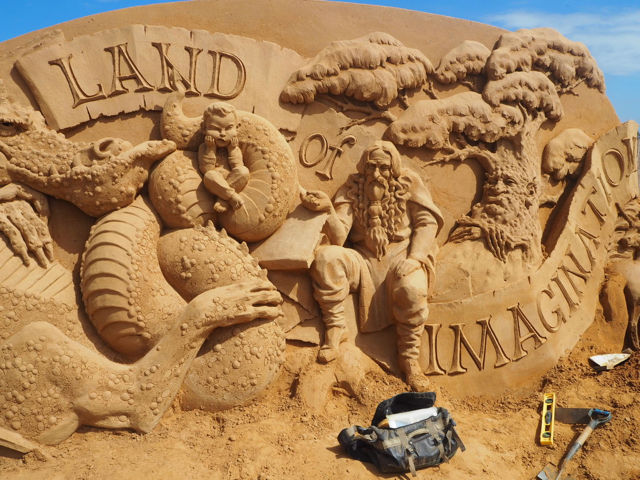 Visitors are invited to be the first to view Sand Sculptures' main attraction 'Lands of Imagination' which was made by twenty one of the world's finest sand sculptors during sixteen days and took more than 5,000 hours! Our review on the blog. If you are visiting the city, checkout our TOP 5 FREE family activities, our Melbourne Daily Spots, our list of Parents Rooms, Playgrounds and areas to visit to keep the kids cool this summer.